From the good luck provided by shamrocks, rabbits’ feet, and horseshoes to the misfortune caused by broken mirrors, black cats, and umbrellas opened indoors, our lives are filled with signs and superstitions that guide our destiny and influence our fate. Fortunately, Field Guide to Luck can help you recognize dozens of influential charms, dates, sayings, and symbols wherever you encounter them. Learn what objects are on your side, which practices are best avoided, and where these curious beliefs come from. This indispensable guide reveals their fascinating origins and offers tips for putting them into practice. With Lady Luck on your side and a lucky penny in your pocket, you’re sure to lead a charmed life. Each of the 94 entries includes a general description, origins, variations, practice, and cultural context, as well as one to three related superstitions to send readers on a sort of choose-your-own-adventure experience. Topics range from the familiar (black cat, fortune cookie, wishbone) to the more exotic (evil eye, maneki neko, yantra), and each entry has examples drawn from movies, television, and music. Seventy of the entries are also illustrated in a center section of color plates. Published at $15.95, our price only $12.95. 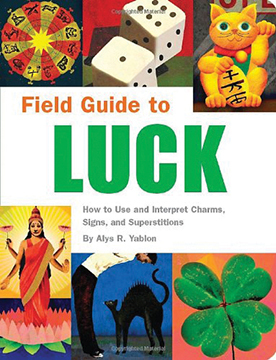 FIELD GUIDE TO LUCK: How to Use and Interpret Charms, Signs, and Superstitions By Alys R. Yablon. 304 Pages. 5x9 Paperback. Illustrated.